Get connected to the zeitgeist of the truth and freedom movement. Use your brain, face your fears and break out of the chains that bind your mind. This is just a reminder that the control system which has most of humanity under its spell has been in place before any of us were born. A lot of practice and perfection has gone into maintaining this current status quo which is now losing its influence with every day that goes by. See the deception with your own eyes. Follow alternative news and social media anti-mainstream media news for key stories and key arguments to follow up on yourself. Don't believe anyone just because they represent a certain logo or website. 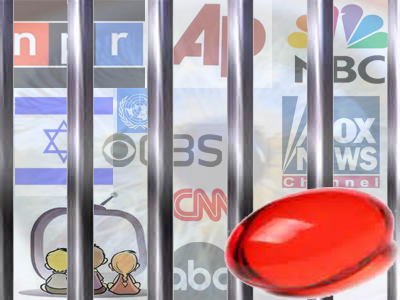 See the stories, see where mainstream media is being exposed in real-time, then test these arguments for yourself and soon you'll see that the criticisms against the controlled mainstream media that are coming out every single day are very legitimate. You'll soon realize you've been had. When you do wake up, relax, don't panic, we were all there too. All of us were had by the mainstream media and overall synchronized memes put out by the control system. Most important, realize that your initial awakening is but the first step in a long journey of truth and reason that will penetrate the deepest level of your mind. It's the so called red pill. I've seen many people react to the chemical and physiological effects of the metaphoric red pill. It's a manifestation of the awakening that all of humanity is capable of. It's similar to being transformed by a religious experience only you never wake up again to another truth.